For many of today’s advanced materials, analysis by SEM is an ideal technique for rapidly studying material structure and properties. Fischione Instruments' Model 1061 SEM Mill is an excellent tool for creating the sample surface characteristics needed for SEM imaging and analysis. Automatic sample thickness sensing maximizes throughput, while magnetic encoding provides absolute positioning accuracy. The Fischione Instruments’ Cross-section station is a tool for creating pristine cross-section samples ready for ion milling in the SEM Mill. Click here to learn more about the Cross-section station. The SEM Mill features a vacuum load lock for rapid sample exchange. The load lock is ergonomically designed; simply lift the load lock cover to load the sample holder onto the stage. Replace the cover and evacuation of the load lock occurs within a few seconds. The vacuum secures the load lock cover in place during ion milling. An electronically controlled elevator then moves the sample into the milling position. At the conclusion of the milling process, the sample holder returns to the load lock, but remains under vacuum until vented by the user. Venting takes only a few seconds. 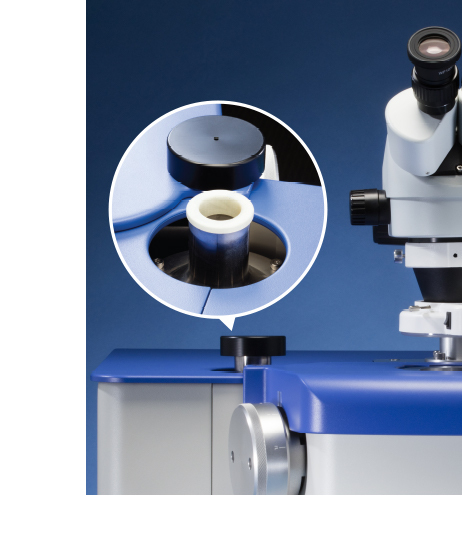 An optional vacuum capsule allows you to transfer the sample to the SEM under vacuum or in an inert gas. The SEM Mill’s vacuum chamber remains under continuous vacuum during operation. 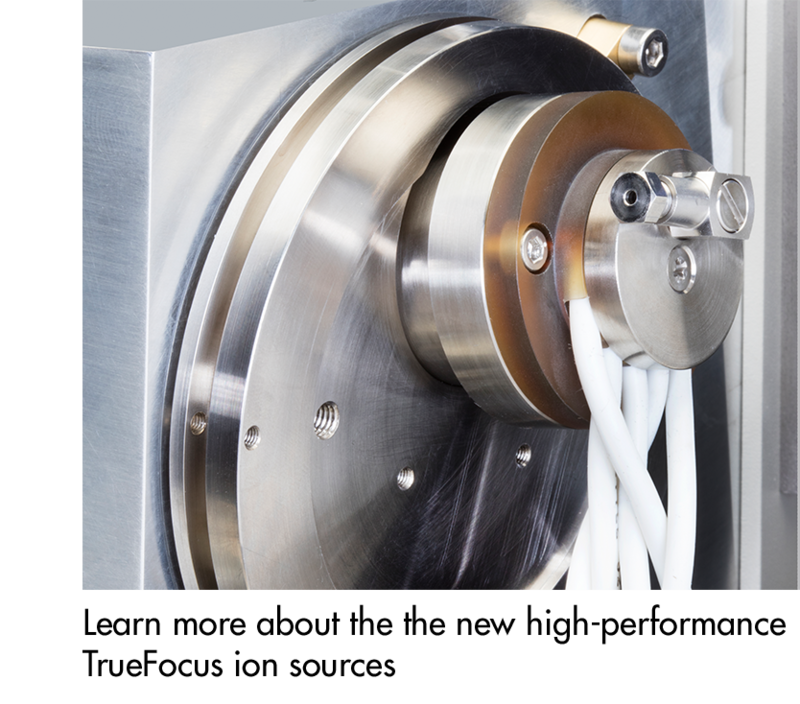 A load lock isolates the high chamber vacuum from ambient during sample exchange, ensuring optimal vacuum conditions. The ion sources are tilted to provide the desired milling angle. The continuously adjustable ion source tilt angles range from 0 to +10°. The ion source angles are adjusted using the left and right ion source controls. You may choose to use one or both of the TrueFocus ion sources. If you are using both ion sources, you can adjust the beam angles independently. When both ion beams are directed to one of the sample’s surfaces, milling rates are doubled; this capability is useful for applications such as planar polishing of samples. Automated milling angle adjustment using the touch screen is an available option for the SEM Mill. Adding this capability enables you to create multi-step milling sequences that include the automatic adjustment of milling angles throughout the milling process. Sample rotation is 360° with variable rotation speed and a sample rocking feature. The instrument automatically senses the sample thickness and establishes the milling plane, which maximizes throughput. A magnetic encoder provides absolute positioning accuracy. Although milling at low angles with low ion beam energies reduces sample heating, temperature-sensitive samples may require further cooling. Liquid nitrogen cooling of the sample stage is very effective in eliminating heat-induced artifacts. The SEM Mill’s liquid nitrogen system features a dewar located within the enclosure that is fully integrated and interlocked. The dewar is positioned near the operator for easy access. Two dewar options are available: a standard dewar for applications that require 3 to 5 hours of cooling during ion milling, or an extended dewar for applications that require 18+ hours of operation under cryogenic conditions. Temperature is continuously displayed on the touch screen. The SEM Mill offers the ability to program and maintain a specific temperature between ambient and cryogenic. At the conclusion of milling at cryogenic temperatures, the stage temperature is automatically increased to ambient before venting to avoid sample frost and contamination. A thermal safeguard can be programmed to a specific stage temperature threshold at which the ion sources will be deactivated if the liquid nitrogen in the dewar becomes depleted. The ion milling process can be automatically terminated by elapsed time or by temperature. A timer allows milling to continue for a predetermined time and then turns off the energy to the ion sources when the time has elapsed. The sample remains under vacuum until the load lock is vented. The thermal safeguard associated with the sample cooling system will stop the process if the sample stage reaches a preset temperature. The ion milling process can be monitored in situ in the milling position when using either the optional stereo or the high-magnification microscope. The viewing window is protected by a shutter, which prevents buildup of sputtered material that could interfere with sample observation. A stereo microscope (7 to 45 X) enhances sample viewing. The microscope’s long working distance allows the sample to be observed in situ while milling. The SEM Mill can be configured with a 525X or 1,960X high-magnification microscope coupled to a CMOS camera and video monitor to view samples and capture images in situ during milling. This system is ideal for preparing site-specific samples. Both the high-magnification and stereo microscopes have light sources that provide top-down, user adjustable, reflected sample illumination. Milling parameters are entered via a 10-inch touch screen, which can be physically positioned to your preferred height and viewing angle. From the touch screen, you can control a broad variety of instrument parameters, such as ion beam energy, milling angle, sample motion, sample position, and process termination. For automated, unattended operation, you can program a series of milling sequences. A typical approach is to begin with rapid milling to remove larger amounts of sample material; then, as the sample thins, a lower milling rate to polish the sample. These milling sequences can be easily stored and recalled for future use. During milling operations, milling sequence progress and instrument status are displayed in real time on the touch screen. Advanced functionality includes tools for managing sample data, maintenance and log files, and image storage, as well as remote access, which allows you to oversee milling operations via a remote computer if the SEM Mill is networked with your facility’s intranet. Access to instrument configuration, administrative and diagnostic tools, and maintenance and log files, is controlled through privileges granted to the various user levels and require login credentials. An optional stack light allows you to view the system status from across the room. Two mass flow controllers provide independent and automatic regulation of process gas for the ion sources. The gas control algorithm produces stable ion beams over a wide variety of ion source milling parameters. The process gas is ultra-high purity (99.999%) argon. The integrated vacuum system includes a turbomolecular drag pump backed by a multi-stage diaphragm pump. This oil-free system assures a clean environment for sample processing. Because the gas requirements of the TrueFocus ion source are small, the 70 lps turbomolecular drag pump produces an operating system vacuum of approximately 5 x 10-4 mbar. The vacuum level is measured with a cold cathode, full-range gauge and is continuously displayed on the touch screen. Due to the efficiency of ionization, maintenance of the TrueFocus ion source is minimal and the components have an extremely long life. Material sputtered from the ion source is negligible, minimizing both sample contamination and component maintenance. Automated shuttering prevents the buildup of sputtered material on the viewing window. All system components are easily accessible for routine cleaning. Fischione Instruments is committed to support maximum instrument uptime. To that end, the SEM Mill has remote diagnostics capabilities built in. 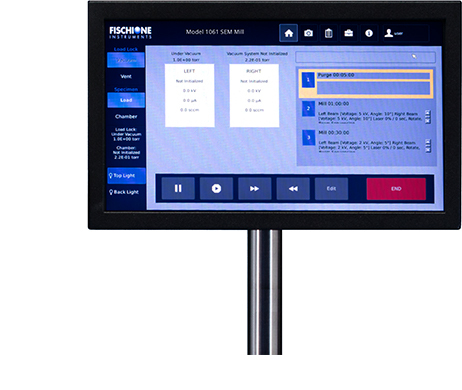 When connected to the Internet, the SEM Mill can be accessed remotely by Fischione Global Service for rapid troubleshooting and diagnostics support. To learn more about Fischione Global Service’s comprehensive service and preventive maintenance programs, contact Fischione Global Service. *Standard size; other sizes available upon request.